HISTORIC DOCUMENTS – CHARU MAZUMDAR. Communist Party of India (Maoist) Press Release – The offer for peace talks by the President of India is nothing but a ploy! Statement: COMMUNIST PARTY OF INDIA (MAOIST) Condemn Gruesome Mumbai Bomb Blasts! Telephone extensions… on BUDDHA SMILES! 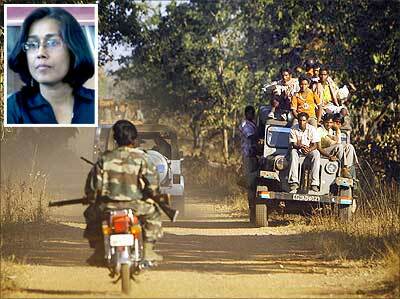 Sallie on TOP NAXAL LEADER HELD? FIRST MAY DAY CELEBRATION IN INDIA. BRIEF HISTORY OF NAXAL MOVEMENT IN WESTERN GHATS, KARNATAKA. The last six weeks have seen a series of deadly attacks on security forces and civilians by the Maoists or Naxalites, the insurgent group present in eight states, which Prime Minister Manmohan Singh describes as the gravest threat to India. While the Maoists claim they are fighting a war on behalf of landless tribals, their opponents call them armed terrorists exploiting tribal sentiments. In their worst-ever attack on April 6, Maoists massacred 76 Central Reserve Police Force personnel in Dantewada, Chhattisgarh. In another murderous attack on May 17, they killed 40 civilians and special police officers in Bijapur, Chhattisgarh. The recent attacks have left Union Home Minister Palaniappan Chidambaram grappling with the most serious internal security crisis on his watch. As the government revisits its anti-Maoist strategy with Congress party President Sonia Gandhi advocating a redressal of the root causes of the problem, the debate on how to tackle the issue has gained in significance in the public space. Sociologist Nandini Sundar is a prominent thinker on the Maoist debate. Along with two other intellectuals she filed a public interest litigation in the Supreme Court in 2007 against the excesses of the Salwa Judum, the anti-Maoist organisation of tribals in Chhattisgarh. In this interview with Girija Shivakumar, Sundar, a professor at Delhi University, argues how the home minister has no grasp of the situation and highlights the importance of peace talks in finding a solution. Often analysis indicates that development should take priority over anti- insurgency actions. How can development based activity be pursued in an atmosphere where schools buildings are being attacked/roads destroyed? I don’t think there is a consensus that development should take precedence over Naxalism. I think that their sustained struggle actually shows that this problem has been neglected. If you listen to Times Now (the television channel), (its editor-in-chief) Arnab Goswami is calling for India versus the others, as if these Adivasis living in Chhattisgarh are not part of India. The rehabilitation plan which the Supreme Court had asked us to prepare was to understand the people living in this war-ridden atmosphere. We have asked college boys and districts judges to come out from the villages and give us information. We have looked at the war situation and tried to see what needs to be done immediately for rehabilitation. Ultimately for anything to work there will have to be peace talks — that clearly is the bottom line. Nandini Sundar, professor of sociology, Delhi School of Economics, and historian and writer Ramchandra Guha have filed a petition to stop the Chhattisgarh government from supporting and encouraging the Salwa Judum, a people’s movement to counter the Naxalites.The state government has denied that the Salwa Judum was a state-sponsored movement. The Supreme Court has disapproved arming the Salwa Judum, and the case continues. According to a report by Human Rights Watch, caught in a deadly tug-of-war between an armed Maoist movement on one side, and the government security forces plus a vigilante group called Salwa Judum on the other, civilians have suffered a host of human rights abuses, including killings, torture, and forced displacement. The violence has destroyed hundreds of villages and uprooted tens of thousands of people from their homes. The armed movement by Maoist groups spans four decades and 13 states across India. They purport to defend the rights of the poor, especially the landless, Dalits and tribal communities. Sundar’s book Subalterns and Sovereigns: An Anthropological History of Bastar traces the expansion of the colonial and the post-colonial state in Bastar, central India, between 1854 and 2006. The author’s account of the region is at once the outcome of an intellectual as well as personal encounters with the region and its politics. Sundar spoke to Rujuta Paradkar about the policy and politics adopted by the government of Chhattisgarh, the Salwa Judum and “the way in which people fall through the cracks of the democratic process”.